We are getting very close now. I apologies about the delay between posts however I can say that there has been a lot achieved since the last time we spoke. Whilst my initial thoughts of a large international team working together to create this very Egyptian story never eventuated, obviously with the exception of all of you who truly are the international team behind this Egyptian story, I have in fact become the quintessential one man band. I have raised and am raising the funds to produce this film, I have run an online retail store, fought with mailing systems and monetary systems. I have filmed over 200 hours of footage over the past two and half years, I have worked moulded and bent this footage into a rough cut of just over two and half hours and I will in the next few weeks have cut a 90 minute story which will not only tell the story of a few of the tentmakers but also offer a glimpse into what the past three years in Egypt have been like. This link, The Tentmakers Teaser, will take you to a 4 minute video which will give you a glimpse of what the final film is to be. My hope is that it will then only be a matter of months before it is available to play in festivals and cinemas world wide. A recent trip to France speaking with international broadcasters and distributors has raised some eyebrows and inshallah will become something more than just glances. I have to thank everyone of you for your assistance as you truly are the reason this film has been made. You truly are the funds behind the film, the believers in the project. You are the reason this film will be made. Please share this teaser with those who may not know about the film, or those who may be interested and please keep an eye on your email and on our website www.tentmakersofcairo.com for more information about the film and opportunities for further support. I cannot thank you all enough, things have not gone the way I had initially thought and yet the way they have gone has only made for a much stronger, real and honest film. Thank you once again and you will be hearing from me again very soon. Inshallah those waiting for T-Shirts have recently received them in the mail. Believe us when we say it was a mammoth task to get them all out to you. John in his new 'Tentmakers of Chareh El Khiamiah' T-Shirt. We have already got some great feedback and comments about the T-Shirts so please make sure to send us a message or even a photo on our Facebook page. We really have to thank you once again for your support, as it was only because of you that we have been able to get through the initial stages of production and to be now entering the next phase. We will soon have even more opportunities to support and commit to the making of a great film about the lives of the tentmakers of Cairo. If you or anyone you know is still keen to get their hands on a T-Shirt we now have them available in our Shop along with other items and pre-order DVDs and BuRays. All proceeds from sales in our shop go directly towards the production of the documentary film, “The Tentmakers of Chareh El Khiamiah”. If you haven’t already signed up to our Mailing List make sure you do as we have a few events and potential screening coming up that we wouldn’t want you to miss. Also our Facebook page recently tipped over 5000 ‘Likes’ with people worldwide tuning in to find out more about the tentmakers of Cairo. So make sure you ‘Like’ our page. Mabruk everyone and lets keep this going. Shukran for your continued support and commitment to the documentary film, “The Tentmakers of Chareh El Khiamiah”. Sick little boy and opportunities. Art in Action and a date with Big Ben. Last year when we were packing our bags to take off for the UK we had been warned of torrential rain, possible floods and the need for what Brits call Wellingtons and us Aussies call Gum Boots. However this year as the time came to again pack our bags we were warned of extreme heat, sunburn and I really wish they had of told us about the disappointment us Aussies would feel over the cricket; a sport played by those lucky enough to have been or in our case still be a part of the Commonwealth. Considered too boring by most others. And so it is that Hosam, Tarek and myself headed off to Art in Action in Oxford, UK, a small art festival that attracts more than 40,000 people over the course of its four days. Whilst last year we had been keeping everything elevated and away from the sides of the tent we had been put in. This year we tore down the sides of the tent and displayed the work of the Tentmakers of Cairo on the sides of the tent. It looked fantastic and from a distance spectacular. Drawing people from all over the festival to come and have a look at the intricate and detailed applique work of the men. Over the four days many people passed through the International Tent which was home to jewelers and leather workers from Mali, sculptures from India, Turkish textiles, Russian carvings, Italian jewelry, Uzbeki carpets and, of course, the Tentmakers of Cairo. The exhibit was crowded most days for most of the time and much of the work that had been brought to the exhibition was not to return. Birds, ducks and animals were the big sellers with many a disappointed return, as potential customers would leave for a tea so as to think only to return to find the piece they had thought about gone. Both Hosam and Tarek brought large 2 meter by 2 meter masterpieces and both were taken home to English homes. The only thing that did not sell well were the smaller cushion covers which last year had been the sold like the pancakes in one of the other tents close by. Interest was high and many people who have been following the Tentmakers of Cairo through our website and our Facebook page turned up to say hello as well as return visits by people who had seen the exhibit last year. It is always great to hear so much enthusiasm in the questions as well as to see it on the faces of those who watch as both Hosam and Tarek stitched like machines. There is always the odd comment thrown in about how they are doing it all wrong, these comments are always my favourite. Of course people want to know what is happening in Cairo these days with all the attention focused on Tahrir and the new Egyptian politic and the guys just smiled, nodded and said, "Egypt is good, no problem. Morsi is gone". Once it was all over we had a bit of time to spare before heading back to the crazy streets of Cairo and so headed into London to see Big Ben. Joan Fisher was a great guide and got us through a days worth of site seeing in a couple of hours including a short stay out the front of Buckingham Palace waiting for the birth of Prince George, it happened whilst we were boarding some hours later. Hosam and Tarek jostled for position in front of most of the sites and between Joan and myself we managed to click off a few photos of each of them in front of the appropriate monuments. Then it was back on the plane and four hours later we had arrived in Cairo just in time for another massive rally and the streets full of fireworks and confusion. It was quick, it was hot, I wore shorts and both Joan and John Fisher were great hosts, managers, guides, parents and more. Thanks guys. Another revolution for the street. The past few weeks in Egypt have been amazing. How many times can you be involved in a moment of nation building history? For us it is just this once however for the Tentmakers of Cairo it is the second time that events have played a major role in the lives of their businesses and their families. June 30 2013 will be remembered in many ways by many people and will be called many things by many people; a coup, a popular uprising, a rebellion, a revolution, an overthrow and many more descriptions of the event. However what it seemed to be to us was a moment when a large majority of Egyptians, or at least of those who reside in Cairo, took to the streets to say enough is enough. Whether that be against a Feloul dictator or an Islamist one the Egyptian people seem to have had enough. Or have they? A bigger question I suppose than what this blog can address. Many of the Tentmakers of Cairo took to streets along with millions of others in what became more like a festival than a protest or an overthrow. The streets literally buckled with the amounts of people forced into each and every one of them. To move was to take small steps either side of you in the hope that you would not fall to the ground. Although if you did you would be quickly helped to your feet by a smiling face almost inevitably chanting, in Arabic, “Go Out, Morsi!”. There was Koshary, Fool, Corn and Shayee for sale, if you could get to it. Men, women, children and whole families filled the streets - Unfortunately for women it was not always safe and is something that will need to be sorted out quickly and decisively not only by the new government but also by the Egyptian people themselves. There was music and chanting, political speeches and circus acts, as many a young man climbed to the top of a light pole or street sign in order to proudly wave an Egyptian flag. And once then President Morsi had been toppled - how this happened is also a longer debate and one of legal ramifications again much to big to go into on this simple blog – then the jets flooded the skies with red, white and black smoke billowing from them as they looped the loop and drew love hearts in the sky. Fireworks blasted into the air like it was… well by then it was the 4th of July and the party just kept on going. The dangers that had previously been envisioned with going to Tharir Square on June 30 had gone; the civil war, riots and hostilities almost a non-event, at least that was true if you were on the anti-Morsi side. The Tentmakers of Cairo each night became braver and braver as they took their families down to the square and danced and took photographs of themselves in the street. However the reality of the situation, much like that of the initial revolution on 25 January 2011, is that these events hurt Egypt, and the Tentmakers of Cairo, each and every time they happen. Once again tourists will be staying away from the markets and stalls that sell Tentmaker work. Tour buses booked to travel to Khan El Khalili have been canceled and already dwindling profits will be affected. There is a long way to go until Egypt will become the democratically inclusive country it wants to be, open to all political views and persuasions including the now frowned upon Muslim Brotherhood. However a long time before this becomes a reality will be the return of tourism to Egypt. Although things may not be good now it is only a mater of months until we will see tourists once again populating the markets and streets and taking a look at the appliqued masterpieces of the Tentmakers of Chareh El Khiamiah. Part II: Toronto tells us how to make a film. So from Paducah, Kentucky it was on to Toronto, Canada with a brief stop in Nashville, Tennessee. Originally I had planned Paducah to be the final piece in the puzzle and had thought that I would wrap filming and head to Nashville for a week of music and celebration. However the closer I got to Paducah the more I realised that the film was far from finished and the complexity of issues, characters and events would see me filming for a while longer. So a week in Nashville was achieved in one night as we took in the Ryman Theatre and the ‘Band of Horses’. The reason for Toronto was because of the Hotdocs International Documentary Festival and Market, one of the biggest and most important documentary conferences in the world. Full of filmmakers, producers, distributors, sales agents, broadcasters, you name it they were there. I turned up to HotDocs with no real intention of pitching the film or finding a distributor I was more there to take it all in and to learn from some of the people that were there and who were pitching and selling. After four days of films, sessions and networking I had come out of the conference enthused and inspired and ready to take the film to the next level. I met with other producers and filmmakers also filming in Cairo as well as finding out that there really is interest in the film from distributors and broadcasters even at this early stage. I have returned to Cairo and to the film with a lot more focus and intent and have a managed to clear my mind and a path, which will only make this film so much better. So stay tuned for more updates and information about how we are progressing. Also a big thanks to the Mancinni's for helping me find some accommodation whilst I was in Toronto and to Ellie and Sarah for providing such a comfy room and couch. All right so we are home, back in Cairo, and I have finally had a decent cup of coffee not something you will find all that easily in North America. Regardless of the lack of caffeine the recent trip to the States, and their northerly cousins Canada, was a great success on so many levels. We; Hosam, Tarek and I, arrived in Paducah late on the Monday night prior to the American Quilters Society Quilt Week Show and instantly realized the scale of this thing as quilts adorned all of the walls of Paducah Barkley Regional Airport. The only conversation being had by anybody in the airport was about quilts and over the coming days we would run into all of the people we had just flown in with from Chicago. Paducah, Kentucky is a small US town with a population of approximately 30,000 people. It has its home coming queen in the likes of country singer Kelley Lovelace and an all-star quarterback in Corey Robinson, presently playing for the Troy University Trojans. However the one thing that makes Paducah, and everyone knows Paducah for, is quilts. Over the space of one week Paducah’s population definitely doubles and may even come close to tripling in size. These people are mad about their quilts and if there was ever going to be somewhere to really prove the Tentmakers of Cairo as more than a novelty of speed stitching this was going to be the place. Hosam and Tarek where instantly recognised as we checked into our hotel, in fact we had been spotted earlier in Chicago’s O’Hare International Airport on the way in. Everyone we passed who knew the work of the Tentmakers of Cairo was excited to see Hosam and Tarek. Every one of them let us know that they would be at the show and that seeing their work was a high priority. The next day we made our way down to the show as the Tentmakers of Cairo pieces were being hung. Hosam and Tarek walked around and admired the work that now hung across four large walls and was the centerpiece of the room they were in. Two picnic benches ready for them to work on would soon be surrounded by thousands of visitors who had come to see for themselves the speed and intricacy of the Tentmakers of Cairo at work. With time off in the afternoon Hosam, Tarek, Jenny Bowker and I got a chance to do some filming in the National Museum of Quilts. This turned out to be an amazing experience as I think it really came home to both Hosam and Tarek the quality and detail that other stitchers were able to achieve using textiles, needle and thread. There was however a lot of comment about the use of machine work that was not like theirs that is handmade. When they did find something that was hand stitched they were both in awe of the detail and skill. A painted quilt by Hollis Chatelain took the prize as the best quilt with both men in awe of the work and detail, I am pretty sure Caryl Bryer Fallert Gentry, a queen among quilters and quite the star, came in second but I could not be certain of that. The show itself was four days of non-stop people, questions and visiting. Hosam and Tarek tore through work at a great pace. Tarek in particular seemed to have become quite inspired by what he had seen in the quilt museum and started to redesign work that he was already a large part of the way through. Questions were repetitive however always delivered with interest and both Hosam and Tarek had no qualms answering them over and over again. There were a lot of shocked faces, wows and stares of disbelief. The work on the walls sold like hot cakes and each morning pieces would have to be taken down and replaced with more work. Even pieces that Hosam and Tarek had only just placed the last stitch on where scoped up for a bargain price and shipped out the door. On the second day of the show Randy Pace turned up from Texas with a huge Pharonic Tentmakers Piece which was hung in the room above the Tentmakers of Cairo, as space had become an issue where the men where. This piece looked old yet was still in good condition for a piece thought to be somewhere around 100 years old. Sheila Frampton-Cooper, a relatively new though successful quilter, spent a few hours back and forthing through the work of the Tentmakers of Cairo before deciding on the pieces she liked the most. By the end of the show Sheila had almost become a permanent fixture in the Tentmakers of Cairo exhibition often telling us that this was all she was really interested in seeing at the show, although I suspect there were plenty of other people and quilts that took her interest as well. A few more events and big surprises and then the show was over and it was pack up and time to say good bye. This time Hosam and Tarek would be flying home alone as I made my way to Toronto, Canada for another exciting week which would prove a lot of things to me about the film and how there is still so much more work to do. Maybe even more than I had expected. Stay tuned for Part II: Toronto tells us how to make a film. Lancaster Pennsylvania, AQS and lunch with the Kings. Around the middle of March this year Hosam EL Farouk, Tarek Abd El Hay and filmmaker Kim Beamish took to the skies for over 24 hours to reach Lancaster, Pennsylvania in the US of A. On arriving in Pennsylvania at Harrisburg airport they were picked up in a very plush car and driven to the Marriot Hotel in Penn Square, Lancaster. The hotel had been a retail store years ago and many people spoke about coming there when they were young, John A. King particularly remembered the buggy ride he used to make with his mother, but more on that later. 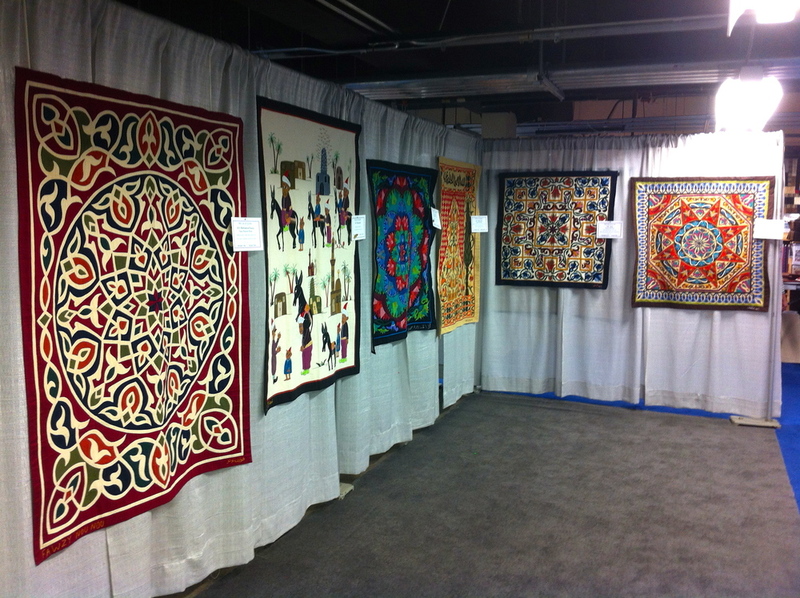 The hotel backs onto the exhibition halls that made up the American Quilters Society Quilt Week show. Three stories of quilts, fabrics, cotton, needles, sewing machines, books, gadgets and more with tens of thousands of people tramping about the show over the four days it was open. Tucked up on the third floor were Hosam and Tarek who drew quite a crowd of amazed visitors. Hosam and Tarek have been sewing for over 60 years if you combine their experience and their needle skills prove it as they tore through 100s of stitches in just over a few minutes. The needles they use are large and one of the most often commented on items. In fact the size of their needles has often been compared to a crow bar and the scissors they both use something akin to garden sheers. However with these two tools and yards of Egyptian cotton they are able to produce some of the most stunning and intricate hand stitched applique many of the visitors to the AQS show had ever seen. Hung on the walls behind Hosam and Tarek were a selection of pieces bought by the AQS from Chareh El Khiamiah in Cairo. The works covered most of the 18 shops in the street and were hot items as the show progressed. Each night the work that had been sold would be taken down and replaced with new pieces and by the end of the show almost all of the pieces had been sold. On the second day of the show standing in the background and looking intently on the stitching of Hosam was a man donned in a black felt hat, black trousers and black jacket with a long though trimmed beard with no mustache. He had a smile from ear to ear and would stand watching for a long while before turning to look at the pieces hanging on the walls and then return to watch some more. Kim had been filming for a while before noticing that this man had become a big part of the scene. He had also realised that this man was a part of the Amish community that lives in and around Lancaster. The Amish are a group of traditionalist Christians known for their simple living, plain clothing and reluctance to adopt many conveniences of modern technology and a do not usually approve of their photos being taken or image being used. So when the opportunity arouse Kim went up to speak to the man to see if there might be a problem. There was none. John A. King is himself a quilter along with his wife Emma G. King and the next day John brought his wife, Emma, to the show. Now in the background of each shot were John and Emma who could not go unnoticed due to their traditional attire. Both John and Emma had smiles from ear to ear and Emma often commented with an, “Oh my!” as Hosam kept a ferocious pace with the needle. After a while it again became necessary for Kim to ask about whether or not there might be a problem with John and Emma being in the scene. This time John introduced his wife Emma who instantly invited Kim for lunch the next day on their farm. As well as letting him know that as long as they were not directly interacting with the camera there was no problem with filming. After three days of filming and many great scenes it was decided that a trip to John and Emma Kings place for lunch could not be passed up. Kim called the Kings and left a message on their voicemail, as they are not allowed to use the phone. A taxi ride out the farm in the pouring rain and Kim was greeted by a big handshake and invited inside. The afternoon passed by quickly however at a slow pace and included a three hour horse driven buggy ride to the local store, past John’s old school and a visit to his youngest daughters house, one of 18 children. John’s daughter had just spent the morning baking 22 traditional apple pies for the church service that was to take place in their barn the next day. Kim returned with talk of an amazing pie and stories of home made peanut butter on fresh baked bread. After returning to the farm John and Emma brought out a collection of their quilts that they themselves has stitched and quilted, John doing the tops and Emma finishing the quilting. The quilts had all of the traditional elements of an Amish quilt with the stars and simple patterns predominant and detailed hand stitched quilting bringing them all together. Kim swapped mailing addresses and will be sending out some cushion covers from the Khiamiah as well as a postcard of the Pyramids on John’s request. Another big handshake and Kim was back in the taxi and headed back to Lancaster. The Lancaster show was very successful and all three of the guys returned happy for the experiences and glad to have met so many great people. What an amazing community we have built. Well, our 30+ day Pozible campaign has just come to a end. What an amazing community we have built. We seriously couldn’t have hoped for a better way to launch into the next stage of production. So, thank you very much for your support and encouragement it is very much appreciated. The past 30+ days have been crazy and quite busy. We’ve been doing research, filming in Paris, web design, social media management, product design (not something we had initially thought would be part of the filmmaking experience), translation, some script writing as well as starting to hunt down Egyptian editors we might be able to start working with on an ruff edit. Next week will see us back on the road, and in the sky. We’re headed to Lancaster, Pennsylvania in the USA to do some more filming with Hosam, Tarek and Jenny Bowker as well as with the American Quilters Society (AQS) team. We are really looking forward to the trip, although there has been some pretty major developments in the street which we hope we don’t miss to much of whilst we are away. But more on that later. After Lancaster, we’ll be back in Cairo for a short stop before heading back to the USA for the AQS Quilt Week Show in Paducah, Kentucky. This is one of the world’s largest textile shows and a show that literally takes over the small town of Paducah. All the time we will be blogging, uploading photos, on Facebook and Twitter as well as preparing some short ungraded grabs of video to wet the appetite. So once again we want to say, “Thank you again everybody for the support, comments, kind words, tweets, posts, good love’n and all of the getting the word out". Lets keep this rolling and continue to get people on board and build The Tentmakers of Chareh El Khiamiah community. Thank you! This great film will happen because of you! Amazing. The Tentmakers of Chareh El Khiamiah is officially going to happen! What an awesome three weeks! The textile, quilting and independent doco community is a strong and powerful thing. We are overwhelmed, but not surprised. We knew that if this film was going to get made it had to have a committed audience. What we have just achieved has shown us exactly that, we have people who are committed to this film and who want to see it. We are so appreciative of your support, thank you so much! This is going to be a great film, a great experience, and we will pay back your generosity by making sure we create something special. This means we have enough funds to travel to the places we intend to travel to. Our goal of $20,000 was always meant to kick us into the next stage of production whilst simultaneously completing the first. This $ 20,000 is going to allow us to travel to the USA to see just how much attention Hosam and Tarek will receive as they arrive in Lancaster and Paducah in March and April, only weeks away. It will also allow us to start translating and transcribing the many hours of footage already filmed. It is our plan to combine this support with personal investment and other potential sources as well. At this time, we have 6 days to go in fundraising on Pozible (we seriously thought we would be begging for support on the last day). We have met our goal and that is so great. However, exceeding the goal means, with every dollar, the film will get so much better. $ 20,000 is a small budget for a feature film project - of course we have plans to add to this via other sources. But with every donation or DVD pre-ordered through Pozible, our film gets stronger, our argument to further funding sources gets stronger and this project continues to grow. So, to every one still considering a pre-ordered DVD, T-Shirt or a donation, rest assured that your support is going to go towards making this a really great film. And to all of our supporters: This film is going to happen because of you! I, we, are seriously overwhelmed but your generosity and am truly looking forward to the shaking all of your hands, or a kiss on the cheek if you so desire, should I ever get the opportunity. We have returned from Paris after a very successful week of filming and research. Where we were allowed into one of Paris’s most famous institutions to film a conversation between Jenny Bowker and Hany Abd el Kader, met with textiles representatives from around the world who are willing to support the film and to help us release it once it is complete and literally thousands of people saw the work of The Tentmakers of Chareh El Khiamiah both in action as Hany stitched and hanging on the walls of the exhibition. Many of these people were lucky enough to purchase pieces to take with them and hang on their walls at home. One Korean man bought the large birds piece you see to hang in the foyer of his companies headquarters in Seoul. Hany also met many people he was able to talk with befriending taxi drivers, waiters, visitors to the show and even finding a picture of the Khiamiah hanging in our hotel. All up a great trip. But now comes the final days of the supporter campaign and we cannot afford to fall one supporter short. We have all worked very hard to get to this point, you included, and we are now only days away from taking the film to the next stage of production. We have achieved so much in such a short time but we can still do so much more. So lets work together to build a great team and to make a great film. So we are now into the last day of L'Aguille en Fete and our second last day in Paris. The reception to the work of the Tentmakers of Cairo has been extraordinary with thousands of people stopping over the four days to take in this amazing art work. Hany has been smiling for four days and each day learning a few more French phrases to entertain and please the French crowd. He has stitched with members of the European Quilting Championships team, has been asked a thousand questions and posed for more photos than we can count. However the biggest reaction has been towards the work itself with plenty a "magnifique!" uttered upon entry to the Tentmakers of Cairo exhibition. People are just amazed and the level of detail and the use of colours. From the filming side of things we most probably had enough footage on the first day however we have shot a little more each day and have found choice moments that will really show the reception to the work and interest in the lives of these men. However we still need to get to the end of our supporter campaign and are now on the home run with only 40% of our goal still to reach. If we do not reach our goal pledges will be returned. So if you could please help in getting the word out and letting those who want to pledge, but haven't yet, know that they are running out of time. Thank you so much for your support and we are really looking forward to making a great film about this uniquely Egyptian culture. We are in France thanks to Joan and John Fisher and their organisation of a Tentmakers of Cairo exhibit at L'Aguille en Fete. Today was a day of setting up a Khiamiah shop in the middle of a large exhibition hall and I must say it is looking pretty authentic. After the set up was done and everything prepared for the show, which will start tomorrow at the Expo site in la Porte de Versailles Paris, we all took a cool stroll down to the Eiffel Tower an obvious must for anyones first trip to Paris. Also what better way to celebrate as we leave another milestone behind us with more than 50% of our supporter goal reached. Here is a photo of Hany and I at the Eiffel Tower, I couldn't talk properly because my face had frozen. Rafael Epstein of ABC 774 Melbourne’s Drive program has extended an invitation for us to have a chat with her this Thursday afternoon to talk about The Tentmakers of Chareh El Khiamiah. Should be a fun time. Hopefully we can shed a little more light on the project and maybe answer some questions that might be out there. If there is anything specific you'd like us to answer or address, feel free to post in the comment section on the blog at cherah-elkhiamiah.com or leave us a comment on facebook and we'll try to mention it. A few weeks ago I went to DARB 1718, a creative space in Fustat Village in Old Cairo, to watch a workshop being held teaching the art of the Khiamiah. What was at first unusual was that this was a class of all women being taught by Sabah Salem, also a woman. Only unusual because of the fact that the street is all men and the work in Chareh El Khiamiah is an almost exclusively male affair. So it was great to see these Egyptian women getting into the art form. When asked why? They all felt that the art of the Khiamiah was dying and that they all wanted to have something to do with keeping the art alive. Sabah Salem is a textiles artist and you can see some of her work on her facebook page, SabahSalemArt , and as I found out later Sabah is keen to publish a book on the history and art of the Khiamiah. Due to my bad arabic and her lack of confidence with english we have put off a longer conversation about the Khiamiah until I can get Ahmed or someone else to help me translate. I went back a week or so later to film the workshop which may become a part of the film. A quick break from filming. A cigarette for Hosam and a Yan Soon for me. Yan Soon is an anise tea which usually comes with about six sugars. I have been here so long now that there is a new order on the street when ordering tea. Kim shayee, a Kim kadee or a Kim soon (this one turns me into a North Korean president) all of these teas then arrive with no sugar and a small plate of sugar for me to add my own. However my tastes are becoming more and more Egyptian as I seem to be adding more and more sugar. Today we went to interview Mohamed Hashem. He lives not far from our new office and after a short walk and a few misdirections we arrived at there home in Al Qadima. A quiet'sh suburb on Alsayeda Albahareya Street which leads up towards Moqahtam and further onto Giza. On arrival we were met by Mohamed's youngest son Rami, who had set everything up for us, and offered the usual shayee before Mohamed came out to meet us. After a quick change from gallabaya and dressing gown into a suit and collared shirt we were ready to go. First question ready... and it was time for Friday prayers. Which means loud speakers turned to eleven calling out to everyone in the neighborhood to come to the mosque. As this came to an end we prepared ourselves again. First question ready... and it was time for the sermon, or the islamic equivalent. However Mohamed wasn't having a bar of it and off he went talking about everything from the history of the Khiamiah, his apprenticeship, how printed fabrics are taking over, the revolution and more. Till as he spoke his last word it all stopped. Quiet. Perfect for an interview. Thankfully when asked if we could do the interview again he adjusted his suite sat upright and off he went again. So in the end all was not lost and we had developed another great relationship in the street, one which ties to one of the oldest families in the Khiamiah and holds some of the best stories. This is a work in progress as is the documentary film ‘The Tentmakers of Chareh EL Khiamiah’ and so it is that we launch our campaign to gather support to make this a great film. So come and join all those already supporting this amazing story about a truly Egyptian art form having to adapt not only to cheap printed copies but also to the effects of an uprising that has literally turned a country on it’s head.